The project has documented different varieties of the Taa dialect cluster spoken by about 3.000 people in the southern Kalahari in Botswana and Namibia. Data were collected between 2004 and 2009. • The project contains audio and video data mainly of stories, narrative texts and elicitation sessions. • These data are partly annotated in Elan-files and Toolbox-files. • The project also includes a sketch grammar, the oral history booklet “!Qamtee |a ǂXanya”, a series of posters as well as linguistic and anthropological research articles on Taa. The PIs of the project were Tom Güldemann and Roland Kießling. Researchers on the team were Christfried Naumann and Gertrud Boden. 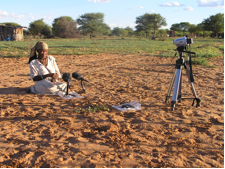 Data collection and analysis have been continued in the project “Inheritance and contact in a language complex: The case of Taa varieties (Tuu family)” as part of the EuroBABEL collaborative research project “The Kalahari Basin Area – A Sprachbund at the verge of extinction” and is going to be extended and maintained in the future.